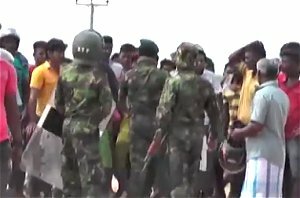 At least two people have died as the Sri Lankan navy clashed with villagers in Kinniya, Trincomalee, last week, after members of the military attempted to arrest a group of men they claimed to be involved in illegal sand mining. The Sri Lankan navy, acting on a reported tip off, arrived at Kandakadum by the Savaru Bridge last Tuesday in a joint operation with the Special Task Force as they attempted to carry out arrests. As the operation commenced, villagers gathered in the area claiming that the arrest of the men was not legal and attempted to halt authorities from seizing them. Three of the men the navy was attempting to arrest subsequently jumped into the river to avoid being held by the authorities. Two of them have since been found dead. With more locals gathering at the scene, the navy fired shots into the air as the crowd began to pelt stones at the security personnel. At least 12 soldiers were injured in the disturbance. See more from ColomboPage here, the Sunday Times here and Adaderana here.